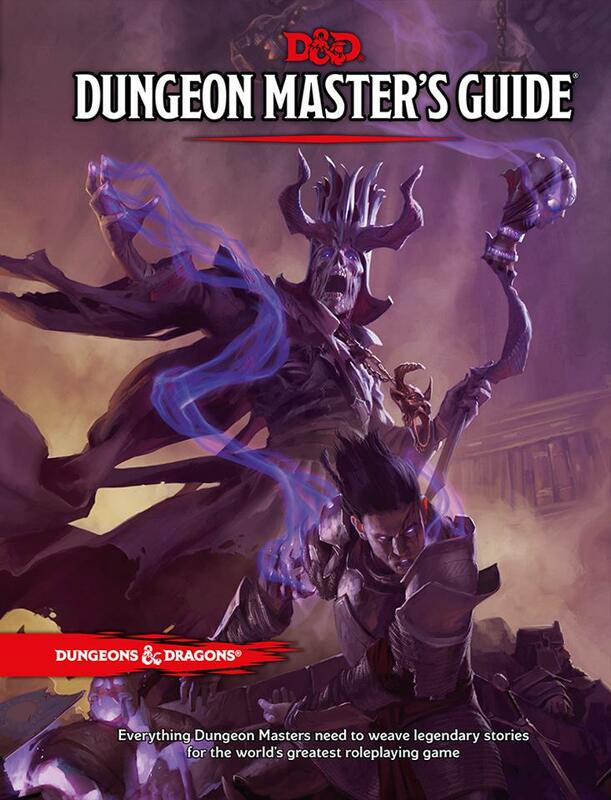 The 5e Dungeon Master’s Guide retreads a lot of familiar ground, as it should for new DMs, or that most vaunted of demographics, players inspired to try their hand at running the game. Interestingly, this DMG is structured exactly opposite of the 4e DMG and firmly places magic items back in the hands of the DM (where they belong, in my opinion). The 5e DMG is broken down in to three parts: Master of Worlds, Master of Adventures, and Master of Rules, in that order. This demonstrates the “outside-in” type of design in which you examine the big-picture themes and create the world first, then adventures, NPCs and adversaries, then the individual rules for certain situations like save DCs, when/why to grant inspiration, and optional rules like facing and flanking as well as diseases and poisons. The 4e DMG was exactly the opposite with the “inside-out” type of design which focused on rules and running the game first, then designing adventures, then world creation. This book is best suited for the tinkerer. It includes rules for adding races, sub-races, classes, as well as variants for initiative, resting, gunpowder, alien technology, hero points, plot points, and a lot of optional systems you can add to your game to tune it how you want D&D to run. It is an excellent resource for both old and new DMs alike and includes a lot of tables for adventure inspiration in the second section. The section on adding races and sub-races adds Eladrin and Aasimar is playable races with features associated with those. The classes section adds the Death domain for clerics, and the Oathbreaker anti-paladin which was alluded to in the PHB. The layout and artwork are superior to the Player’s Handbook, much to my surprise and delight. Apparently they saved all the intense action artwork for the DMs (sorry players!). Almost all of the artwork involves some immediate action, but its not all just wands firing and spell effects. 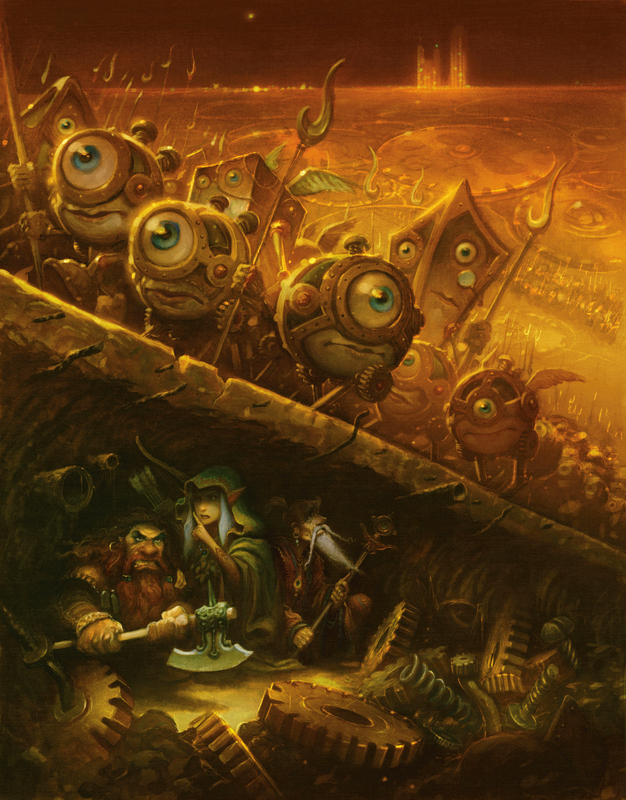 There is party hiding from a huge group of (very minion-esque looking) modrons, a party doing their best against a Tarrasque tearing through a city, a diverse party looking into the maw of a forbidding cave, and the magic item art really stands out. Surprisingly, (and sadly) the DMG has returned to being almost entirely white people. While the PHB was very racially diverse on almost every page, that diversity does not extend to the DMG. The page numbers in the corners are still nigh-unreadable, but the color coded corners of the page that delineate which section you are in are much more prominent than they were in the PHB. I had to look back to see if they even did this in the PHB, and they did, but almost imperceptibly. The index for the DMG is in a much more readable 9 point font, as opposed to the PHB 6 point index. The magic item section is where this book really shines. 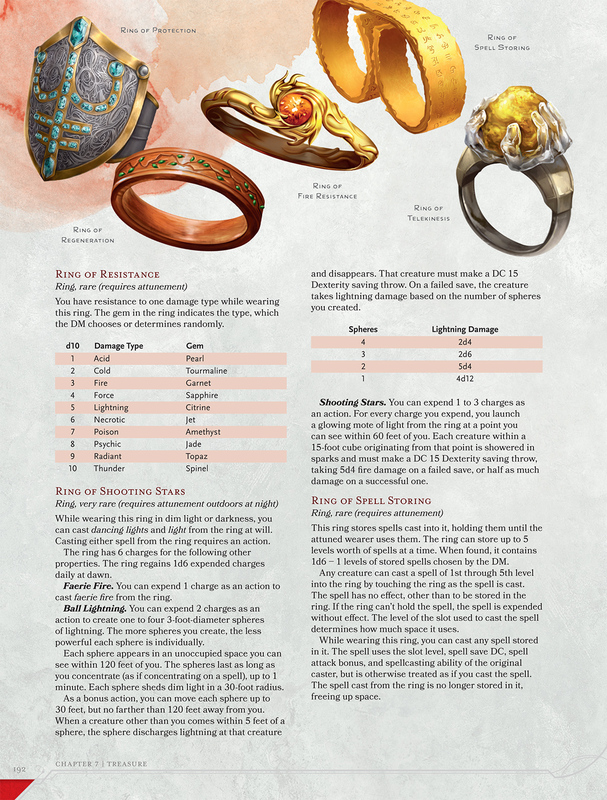 It includes tables for the origin of a magic item, as well as tables for history, minor powers and quirks (much like DCC…) as well as iconic magic items like a necklace of fireballs, boots of elvenkind, sphere of annihilation, staff of power, and a wand of wonder. The illustrations in the magic item sections are really inspirational and well thought out. I really enjoyed flipping through pages of cloaks, rings, staffs and wands, all thematically rendered to make them look unique, and fantastic. The tables for adventure creation cover the main bases and can serve as a good starting point for new DMs. More experienced DMs and players may recognize and see through some of the more tired tropes (a stranger approaches the party in a tavern and urges them to the adventure location, a village needs volunteers to go to the adventure location) but the basics need to be covered before you start getting more creative with adventure design. I am likely spoiled in this regard by the Dungeon Alphabet, in which there is much more creative (in my opinion) adventure seeds, items, and encounters. When you are ready to level-up your adventure design, be sure and pick that up. Overall, once again, I am much more impressed than I thought I would be. This edition has succeeded at getting back to what the core of the game is, while respecting not only the history but the innovations of the last four decades of tabletop RPGs. While expensive, this DMG is 100 pages longer than the 4e DMG, and very much worth it. This book is an excellent toolbox to create your world, and populate it with interesting and diverse characters and adventures. We have made it to the final day of reviews. We really hope that you have enjoyed and gained insight as to what these classes are and hopefully what is needed to take them to the next level. Well here it is, Day 6’s review of the playtest Spiritualist! First Glance: Oh great, another summoner. Will this one be overpowered and then get stripped down later? Delving Deeper: When I first saw this class I was hoping that it was not just a summoner archetype and I will not compare them to this class. This has to be treated seperately. If you did compare them to each other and had played a summoner before, you really need to note the differences between what happens when your phantom dies and then the range of abilities between the two. There are a lot of differences, thats why I would not compare them directly. Another difference is that you have to choose an emotion, such as anger or jealousy, for your phantom. This represents its driving force and represents how it is able to stay in the physical world. Each emotion also provides bonuses and a sort of flavor for when you interact with your phantom. The phantom basically has three settings; shared consciousness, incorporeal manifestation and ectoplasmic manifestation. Shared consciousness involves having the phantom in the spiritualist’s psyche and that is where it feels safest. There are several benefits to having two consciousnesses in one body (improved saves) and the phantom gives a couple of skill bonuses according to your phantom’s emotion. Manifesting your phantom incorporeally is basically having a personal ghost to do your bidding and has the benefit of being incorporeal. Ectoplasmic manifestation is the last ‘setting’ for a phantom. This is a full physical manifestation not unlike Slimer from Ghostbusters (even down to the ectoplasmic slime trail) and allows it to fight as a summoned creature directly with the physical world. A player really has to pay attention as to how the spiritualist and phantom interact with spells such as dispel magic and others that dismiss summoned creatures. You have to pay attention as to how your phantom’s chosen emotion interacts with the three different settings of manifestation. Some work in a certain manifestation and not in others while others are all inclusive. Here’s the Playtest Messageboard on Paizo’s website. It can give you even more insight as to what others are thinking about this class. I will say that I have GM’d a game that had a spiritualist player so I have seen what a phantom is capable of. The phantom with three manifestations seemed to be the main flavor of the class while the spiritualist was less so. I was hoping to see more of an even (50/50) display of abilities. Well, maybe the shared consciousness ability is more for the spiritualist than the phantom itself, but still. It is a truly interesting class that will yield some fun characters for people to play. Character Suggestions: A dwarven spiritualist who is bonded to his great-great-great grandfather phantom that fought in the great goblin-orc was and holds an extreme hatred towards them. Another concept is a spiritualist whose lover was tragically killed in a fit of jealousy and now has returned as a phantom with the jealous emotion tied to it. 4 out of 5 Rating: The spiritualist has a good mixture of abilities. Possessing a multitude of capabilities and spells that gels well with an interesting ghostly companion, the only real drawback to the spiritualist is the spiritualist itself; it may just be the weakest link. I want to give it a 5, but this is the barebones playtest and we need more character choices like feats and emotions to really get that rating. This may be my most criticizing review so far, but I am trying to be honest and informative about these playtest classes. The victim today is the Psychic. First Glance: We are finally going to be able to have that all-inclusive mind-melting psychic juggernaut that the world deserves. Delving Deeper: Or not. When you first look at this class you notice the spontaneous casting for an Intelligence-based character. This is a novel idea, but poorly executed. You will notice the Psychic Disciplines that must be chosen, not unlike a school of magic or cleric domain. Each of the four disciplines uses a secondary stat (Wisdom or Charisma), which I actually like as it discourages ‘dump stats’. The disciplines seem to make the Psychic into a dual-class of sorts, with Lore closely resembling a bard or wizard and Tranquility resembling a cleric. You will also notice the Phrenic Pool, a reserve of mental energy used to attach additional abilities to spells, but at a cost. The pool is connected to the secondary stat, but other than that it feels disconnected. The Phrenic Amplifications that the pool supports are too few to really get an idea about their effectiveness. And since you get both the pool and amplifications at level 3, the first one you would have to take is Will of the Dead (to affect undead with mind-affecting spells). Basically for 2 levels you are unable to do anything against undead and we all know that there are no undead in the fantasy world. Check out what others are saying on Paizo’s Playtest Messageboard. But I feel like I am bashing the psychic like Gallagher on a watermelon, but I see an interesting up-side to the way that psychic magic itself is cast. Psychic spell-casters are a separate branch of caster and effects that target arcane or divine casters do not affect them. It is a whole new branch of magic. And psychic magic’s components are different as well. They use thought and emotion components instead of verbal and somatic components. A thought component, which replaces the verbal component on older spells (color spray, etc. ), is the actual visualization of the effect you are trying to achieve and requires any concentration checks to be 10 higher but spend a move action right before to center yourself to negate that effect. An emotion component, which replaces the somatic component of an older spell, requires the emotional will and desire to cast the spell. A psychic spell-caster under the influence of anything with the emotion or fear descriptor causes problems with casting a spell with an emotional component. I could definitely see a situation where a psychic is grappled, steadies his mind with a move action to lessen the concentration check, then blasts the grappler with mind thrust; all while being grappled. And the notion of undercasting is interesting as well. Basically if you choose a spell to add to your spell-list like mind thrust III at level 6, you are automatically able to cast mind thrust I and mind thrust II as well, using the appropriate spell slot. That creates a little more versatility, especially since a psychic can switch out spells at level 4 and every even-numbered level after that. This means that if you had mind thrust I and picked up mind thrust II at 4th level, you could replace mind thrust I with another spell but still be able to use it at the 1st level spell slot because of mind thrust II and undercasting. Your spell list will grow stealthily. Character Suggestions: Several concepts come to mind; a dwarven psychic with the Lore discipline who strives to collect more and more information about his people or an oread psychic who seeks perfection on a mountaintop with the Tranquility discipline. 3 out of 5 Rating: This class has a severe lack of psychic spells, even with undercasting as an option. At this point, I expect nothing but greater things to come from this class in future releases; more spells, more disciplines, etc. This class is just so basic as to be uninteresting and as flat as week-old Coca-Cola left on the basement table from the last gaming session. Okay, okay… not quite, but close. We are up to Day 4 with probably my favorite class of the playtest, the Occultist. Remember, if you haven’t already; pick up your free Playtest Packet from Paizo before November 25th! First Glance: Don’t we already have magic items? Now normal items are magic, too? Even this pencil? Sweet! Delving Deeper: This class is very, very interesting. You can focus your mind to draw out ancient, psychic energy from objects to use magically. There are so many possibilities for characters with this class! But first, let’s look at the nuts and bolts. You have a certain amount of implements that you can draw power from and each implement, whether it be a weapon or crystal ball or what-have-you, has powers automatically ‘turned-on’ when empowered as well as a selection of ‘extra’ powers. You can expend your focus points to power the implements of leave some energy in them so that latent powers activate. Each implement also has a corresponding school of magic. These schools of magic determine the spells you can cast. After reading the class carefully you can see that you need more mental focus and spells to choose from. Without a full BAB (or the option for a full BAB), those elements need to be increased. Having the choice of 1 spell for each implement (2 spells total at first level) is somewhat lackluster. And since the implements’ special powers are either dependent on stored energy or spent energy, burning that focus will go fast. These issues seem to have been raised in the Playtest Messageboard. Character Suggestions: Two concepts come to mind right away. The first is a dwarven occultist that uses his father’s and grandfathers’ and great-grandfathers’ weapons, armor and equipment, drawing out the power of his ancestors for use in battle. The second concept is a human occultist that uses a Harrow Deck and a Wayfinder for divination and conjuration purposes. This character would combine the characteristics of both implements to complement the use of the other with other abilities (feats: Harrowed, Harrowed Summoning). One of these concepts will be my character for the playtest; I like the dwarf, but I really want to use my fancy Harrow Deck. First Glance: You know that creepy guy at the carnival that keeps staring at you when you pass by. Yeah, this is that guy. Delving Deeper: This class has a smattering of everything that seems to gel really well together. As a spontaneous caster with a spell list consisting primarily of enchantment and illusion spells, the mesmerist can inflict or cure any affliction of the mind. The (no-concentration) Hypnotic Stare is useful to make opponents more susceptible to your mind-affecting spells, and then add some effects from the Bold Stare feature for a more potent combination. By implanting psychic tricks into his allies (or himself), the mesmerist will be able to provide support according to what is needed for the situation. Tricks like false flank will definitely be helpful to a rogue or psychosomatic surge for fighters. Tricks like vanish arrow could help deal with ranged combatants; it all just depends on what type of campaign you are playing in. One of the drawbacks with the Mesmerist Tricks is that they are very situational, the need to touch the recipient and the duration of how long the trick is active before expiring. With all of these abilities at a mesmerist’s disposal, they will definitely test a player’s ability to manage their resources. Honestly, the main problem the mesmerist has is the ability to affect creatures that are not affected by mind-affecting abilities. But that can be easily solved with feats or tricks (Psychic Inception trick) or whatever. Once that is overcome, the mesmerist is the king of enchantment and illusion. Character Suggestions: This class has me stumped. You could make the creepy carnival guy or you could make a creepy gnome guy or a creepy little halfling guy. But seriously, since mesmerists are known for their large egos and powerful personalities, a tiefling could easily be the founder of its own cult or a benevolent, supportive dwarven captain known to have almost absolute loyalty of his command. 4 out of 5 Rating: This class has a good variety of everything. Spell progression, BAB and class features seem to be rounded out nicely. And after trying to brain-storm ideas for characters, a drawback may be the lack of character options that will differentiate between characters. By having more options for tricks and stares in later releases, customization could be better mitigated. First Glance: We will finally be able to use that Harrow Deck that’s been gathering dust on the bookshelf. There are other issues with this class that need to be addressed. The spell progression is possibly too slow and the ‘Trance’ ability needs to be more often. It seems to need a few tweaks to make it take off. See what people are saying on the Playtest Messageboard and see if you agree. After all the negative, I can see this class being extremely fun and diverse. I can envision an entire party of mediums channeling their spirits in many different ways with different effects (See Character Suggestions below). By carefully choosing which spirits you channel, every role of an adventuring party could be covered. Character Suggestions: Some characters to think about on Day 2 is the dwarven medium who channels the spirits of his deceased herioc ancestors, whether they be of his clan or all of the dwarven people. Another option could be the medium who is unable to properly summon demons or devils and offers his body as a vessel to make them able to interact with the physical world. There are options beyond the Harrow Deck! 3 out of 5 Rating: If you are about flavor, this class is a can’t miss. But with that being said, this class needs some oomph; maybe not a full BAB, but better saves or a quicker spell progression could possibly get it to a level on par with other classes. Did you read Day 1’s Review of the Kineticist?